The program aims to bypass prolonged training regimens, and impress new cognitive skills directly onto the brain by manipulating the peripheral nervous system. Learning a new skill is a difficult thing to do. Anyone who has tried to master a new sport or learn a new language can attest to that; it’s a laborious process that can require many years and demand a level of dedication and commitment that few of us possess. So what if you could sidestep the lengthy and tedious business of acquiring a new skill by simply stepping into a “learning machine,” a device capable of downloading new skill-sets directly into your brain à la The Matrix? This is precisely what a new DARPA (Defense Advanced Research Projects Agency) program aims to accomplish. Called Targeted Neuroplasticity Training (TNT), the program essentially seeks to rewire the neuronal synapses and connections within the human brain by precisely and intelligently stimulating the peripheral nerves—i.e., those nerves suffusing tissue and organ systems throughout the body, and that communicate sensory and tactile information to the brain. “Recent research has shown that stimulation of certain peripheral nerves, easily and painlessly achieved through the skin, can activate regions of the brain involved with learning,” observes Doug Weber, the program manager for TNT. The ultimate goal of Targeted Neuroplasticity Training is to essentially “reset” the brain to that period of utmost receptivity that exists in early childhood, when our minds are insatiable learning sponges, greedily soaking up new knowledge and experiences. The practical implications, from a Defense Department standpoint, include reducing the time and expense of training in foreign languages, intelligence analysis, cryptography, and other military and defense applications. 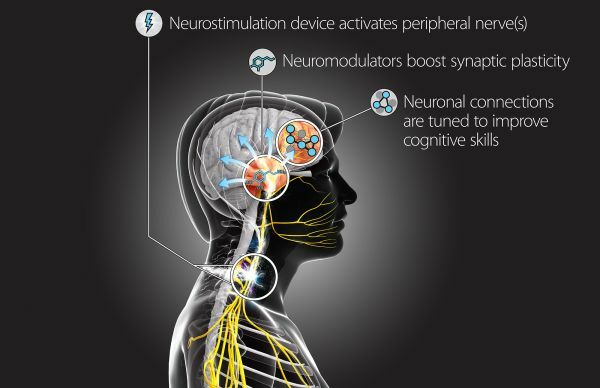 The future research areas of the program will involve understanding how to manipulate the peripheral nervous system in such a way as to maximize learning and knowledge retention, and—from a bioengineering perspective—how to construct a non-invasive device to transmit signals through the peripheral nerves, and enhance neural plasticity.